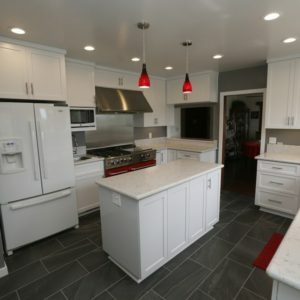 Kitchen remodeling in Anaheim CA can be a big investment. It’s important to trust your investment to a true professional like Cabinet Magic. Cabinet Magic is a licensed contractor with the skills and experience required to guide remodeling projects of any size or complexity to completion. We seriously care about client satisfaction and we will work hard to make sure you love your new kitchen. Kitchen remodeling in Anaheim CA sometimes requires a leap of faith as you go from your sample selections to the real thing. After all, what if the countertops, flooring, paint colors, light fixtures, or other design elements you’ve chosen don’t look quite right when they’re all put together? With Cabinet Magic as your contractor, you’ll never get left in suspense regarding how your kitchen remodeling in Anaheim CA will turn out. We know you want to feel confident of what you’re getting before you entrust us with the project. That’s why we utilize 3D computer rendering to help clients design their new kitchens. This way you can see every detail and approve it before we begin work. Take the first step towards beginning your kitchen remodeling in Anaheim CA today by contacting Cabinet Magic at 800-828-4380 and requesting your free in home consultation. You’ll have an opportunity to bounce design ideas off of us and then receive a free estimate for your remodel.